A lot of my blog posts are to answer questions that I frequently receive. Then I have a ready answer of a blog posting link, or perhaps people read my blog and it saves me receiving an e-mail. This blog posting is along the same lines as I get asked quite frequently about our SDLC (Software Development Lifecycle). Usually this is in regards to someone trying to fill out a giant RFP full of questions that are mostly irrelevant to purchasing ERP software. I covered various aspects of our development process in other blog posting which I’ll refer to here. Plus our process is always evolving as we learn from our experiences and try to improve. What I’m writing about here is specifically what the development team for Sage 300 ERP does, but a lot of it is also used by other Sage teams on other projects. There are always slight variations as the different teams do have their own preferences and as long as they follow the general standards that’s ok. Within R&D we use the Agile Development Methodology, but R&D exists within a larger context within Sage, much of which doesn’t use Agile frameworks. As a result our Agile development has to fit somewhat within a larger non-Agile system that tracks and coordinates the various projects going on around Sage. This is to ensure all departments know what is going on and can plan accordingly. We have a general PMO department that tracks all the various projects. It coordinates getting approval for projects, determining release criteria and coordinating all the various departments such as Marketing, Product Management, IS, etc. So they can do their pieces at the appropriate time. Initial product ideas come from our Innovation Process, but before converting an innovation idea into a larger development effort there is usually some POC work and some initial rough estimates that then lead to a project kickoff process where an initial business plan, along with an initial project plan are presented and either approved or rejected. The project is then tracked by PMO as it goes through development and then at the end when the Agile part of the development is done, there is a release certification meeting where all the stakeholders get together that the solution is ready for customers. This includes that the software is ready and of a high quality, but also that support is ready, training material is available, back end systems are setup to take orders, marketing is ready and all the other pieces that go into a product launch. Also at this time we run a final regression to ensure that everything is working correctly. Generally this is only a couple of weeks as a sanity check that the Agile process below worked correctly. Before making the product available to all customers, we first spend a few months in a controlled release with a handful of live customers to ensure everything works well for them. This not only tests the software, but their ability to be on-boarded, supported and trained. After this has proceeded successfully then the product is made available for everyone. Some of these reasons for this non-Agile framework is that a number of parts of our organization having adopted Agile yet and eventually they will need to if we are to have truly effective cloud based products. The other reason that I blogged about here, is the need to coordinate many disparate teams working on different parts of a larger solution. Within R&D we use the Agile Development Methodology. 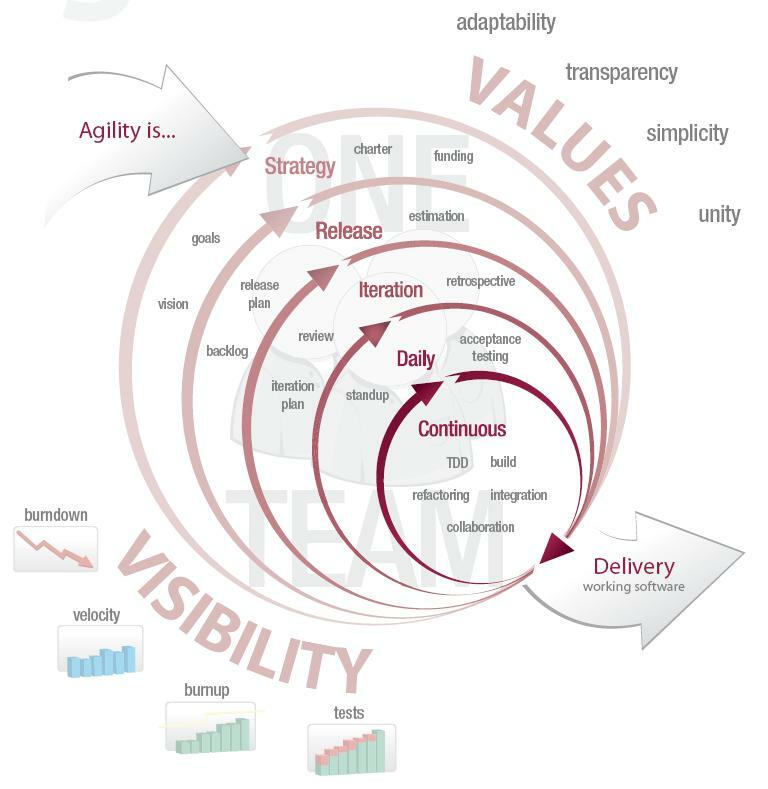 I’ve blogged about Agile development a number of times: here, here, here, here and here. We’ve been using Agile programming for a number of years now. We use 2 week sprints, have sprint planning, maintain a backlog, have daily standups, sprint demos, sprint retrospectives and all the other aspects of Agile. We use VersionOne to manage our projects. In Agile you execute the backlog story by story and have very tight rules on what it means for a story to be “done”. This way as each story is completed, it is fully tested, documented and ready for use. The important thing here is to not build up a large list of defects that need to be fixed near the end of the project. Basically when the last story is finished (done) then the product should be ready to put in customer’s hands. The code conforms to Sage Branding Guidelines. The code is reviewed for applicable use of all documented standards. The code conforms to UX wireframes, design and CSS guidelines. Ensuring stories are done is the key to a well-run Agile process, probably more important than a well-structured prioritized backlog. As part of developing for the cloud, we want to release fairly regularly and can’t afford long manual regression tests. As a result we have a lot of emphasis on Unit Tests and Automated tests, such as those blogged here. Similarly branching strategy, source code management, build management and continuous integration are also important parts of this process. This was a quick overview of our Sage 300 SDLC. With any big project there are always a lot of moving parts and these have to be tracked accurately and reliably. Agile doesn’t mean that we don’t have deadlines or firm requirements. It does mean that we develop the most important things first and build quality in from the very start.